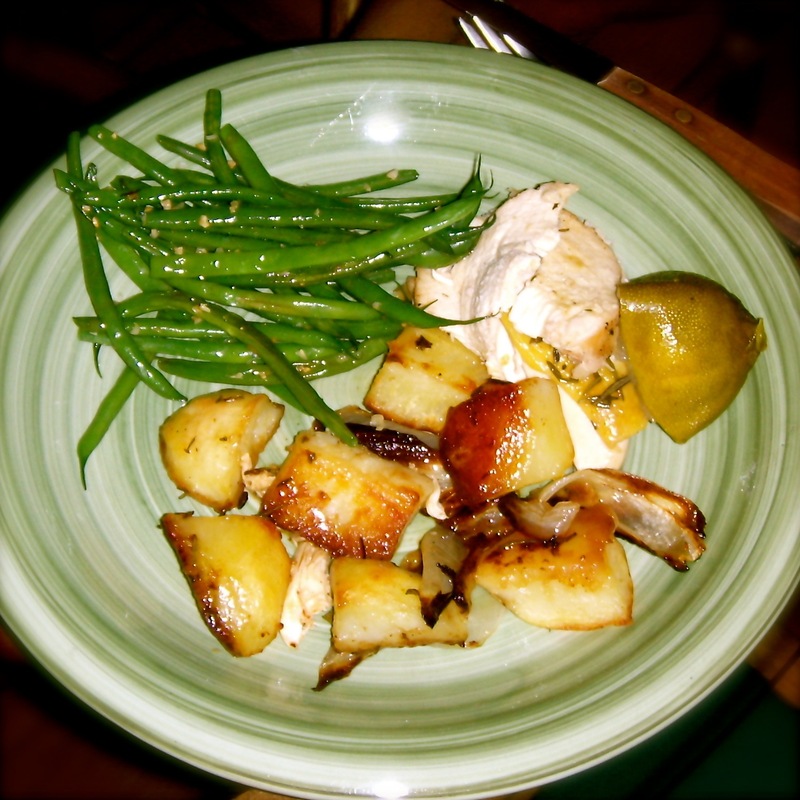 I have finally used up our roasted chicken from the other night. I was shocked at how much meat was there was. I shredded it and slow baked it to make a nice, crispy, lightly salted garnish for our soup. This soup is a combination of several recipes I perused online. If I make it again, I’ll definitely blend it more. The only food processor i have here in Guate is this tiny thing that barely chops stuff up enough for pesto. Otherwise, I think the flavors were really good, especially with the garnish. Husk the corn, chop off all the kernels and set them aside. Place the cobs in a large pot and cover with cold water. Bring to a boil then remove from heat and let the cobs steep for 30 minutes. Meanwhile, preheat oven to 400F. Arrange tomatoes and garlic so they’re spaced evenly apart on a rimmed baking sheet, drizzle with olive oil and bake for about 15 minutes, or until the tomatoes start to wrinkle. Once the corn stock is finished, strain it into a medium sized pot (or large if you have another large one). Add tomatoes, onion, halved jalapeno, garlic and the extra evoo from cooking. Simmer for 15 minutes, until vegetables are tender. Then add reserved corn kernels and cook another minute or two. While the veggies are simmering, turn the oven down to 350F and bake the shredded chicken on the same baking sheet that the veggies were on for 20 minutes, stirring after 10. Working in batches, transfer soup to a food processor and pulse to desired consistency. At this point I wanted to cook off more of the liquid, but you can also make the soup ahead of time and just refrigerate till you’re ready to serve. 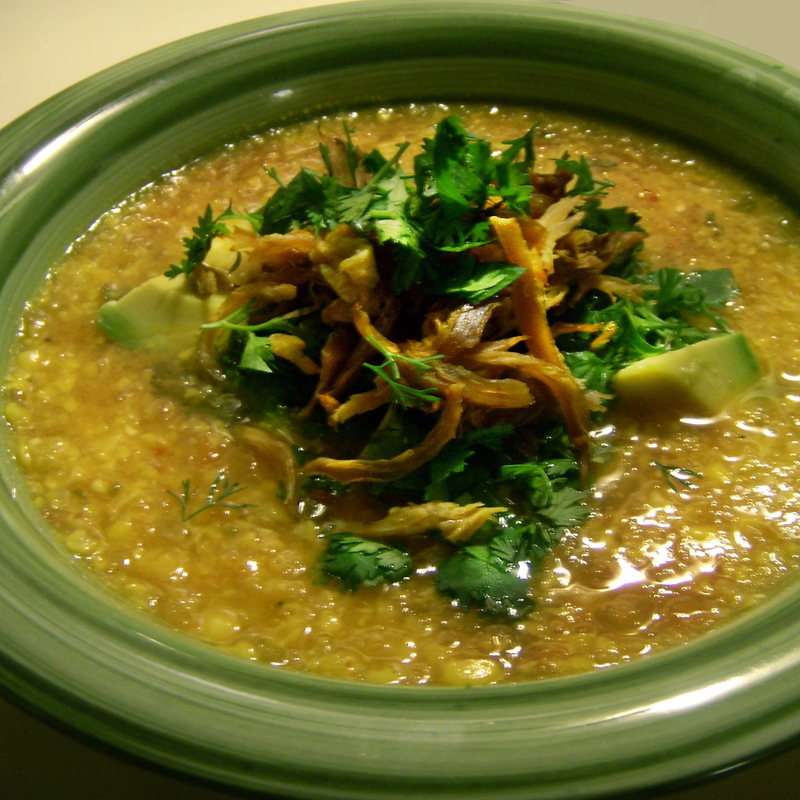 Garnish each bowl with a quarter of the avocado, chopped, crunchy chicken and cilantro. 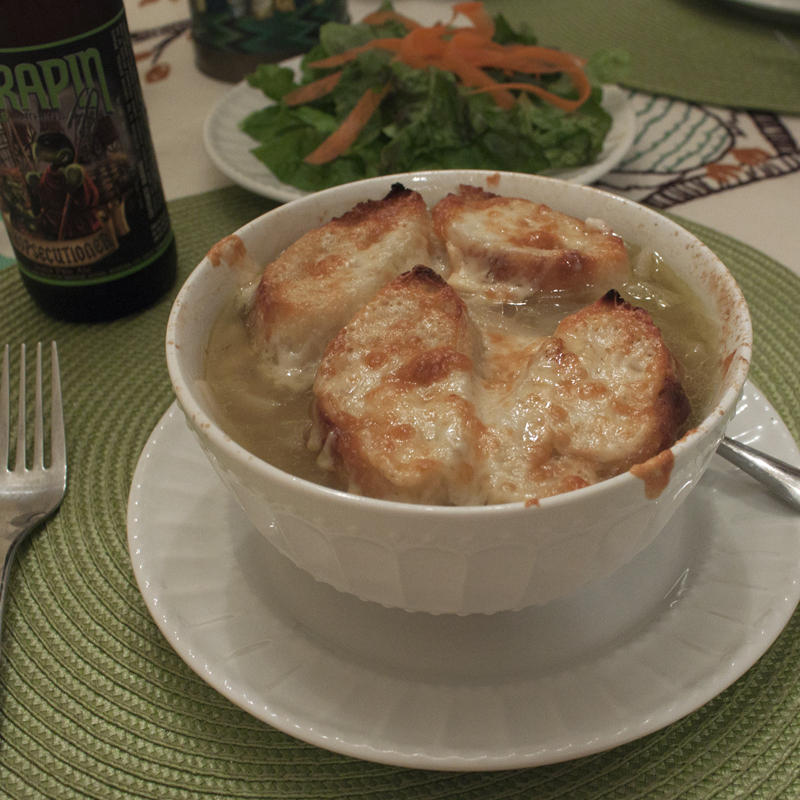 This was the first time these Jenkins had tried a new french onion soup recipe – we have been so happy with our other one. Joe picked up some really good local IPA. The label of this particular beer, the Hopsecutioner, brings back fond memories of teenage mutant ninja turtles. Bring broth, water, spices, and 1/2 tsp salt to a boil. Remove from heat and let steep 15 minutes. Meanwhile, cook onions in oil with 1/4 tsp salt in a heavy medium pot over medium heat, covered, stirring occasionally, until deep golden, about 15 minutes. Add brandy and boil, uncovered, until reduced to 2 Tbsp, about 1 minute. Add broth to onion mixture and briskly simmer, uncovered, 10 minutes. Season with salt.